The look of your reports when you arrive at the ADR recording studio reflects on your professionalism, so you don't want sloppy reports that are hard to read. You want a clean, accurate presentation of the information. You want it customized for each person: the actor, the editor, the director, the mixer, and the recordist. 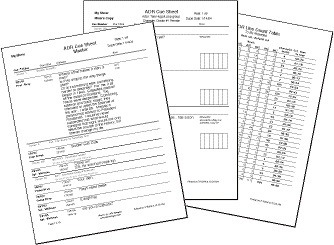 ADR Manager comes with default reports for the different people you'll be dealing with. And the reports are smart: They'll automatically display the information you want displayed... a critical feature if you're rushing to meet a deadline. For instance, cues with a lot of dialogue will not get cut off, notes you don't want an actor to see do not get printed on the actor's cuesheets, and "To Be Recorded" line count tables tally only cues that have yet to be recorded. But let's say you still aren't happy about how the report looks. 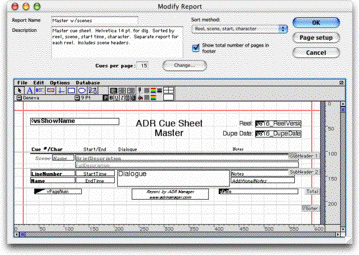 ADR Manager comes with a complete graphical layout editor that lets you customize a report to suit your needs. You can change the font type/size/style/color, or change where things are located on the page. You can add a logo. There is even an advanced capability to allow you to write scripts, such as special page break processing for information created on-the-fly. In short, you can change absolutely everything on a report - all with an easy-to-use drawing graphical interface. Once you've settled on the report look, simply do a search on the cues you wish to print, choose the report, and click. ADR Manager batch prints everything you've selected, collating it and inserting page breaks between reels and characters. Print the whole show with one click!